While any dog of any breed can develop epilepsy, some breeds are predisposed: boxers, Labrador retrievers, Belgian shepherds, petit Basset Griffon vendeens, Irish wolfhounds, English springer spaniels, Australian shepherds, Bernese mountain dogs, standard poodles, border collies, and border terriers. Veterinarians in companion animal practice are familiar with canine idiopathic epilepsy, a neurologic condition that affects an estimated 1 in 111 dogs.1 Companion animal practitioners are also familiar with the shortcomings of current therapeutic approaches, which include medication side effects and breakthrough seizures. While the precise cause of canine idiopathic epilepsy is unknown, the effect in the brain has been documented as a rapid, uncontrolled discharge of neurons within the brain’s cerebral cortex that leads to seizures. Dietary therapy: a new approach to managing dogs with epilepsy? While high-fat, low-carbohydrate diets utilizing long-chain triglycerides have been used and studied in children, this type of diet has yet to be shown to significantly improve seizure control in dogs.17 In addition, such diets also are unsatisfactory from a nutrient and palatability standpoint for dogs requiring lifelong therapy. Fortunately, dogs can metabolize medium-chain triglycerides (MCTs) to produce ketones,18 and experts believe that dietary MCTs may also have direct antiseizure effects via blocking the alpha-amino-3-hydroxy-5-methyl-4-isoxazolepropionic acid (AMPA) receptors in the brain.19 Diets supplemented with MCT oil for dogs can also be formulated with lower amounts of fat and higher proportions of protein and carbohydrates than traditional ketogenic diets—an important factor when a diet needs to be fed for the remainder of a dog’s life. 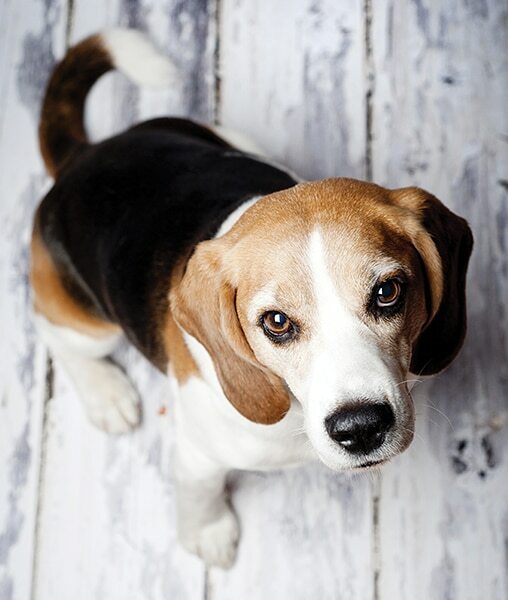 Neurologic researchers at the Royal Veterinary College (RVC), in partnership with Purina, recently investigated the potential role of diet in the nutritional management of dogs whose seizures were not being well controlled with AEDs. While achieving complete remission was not considered realistic for many patients, the goal was to reduce seizure frequency in epileptic dogs on chronic AED therapy. The results of this study inspired Purina to develop the Purina® Pro Plan® Veterinary Diets NC NeuroCare™ diet, which is formulated with MCT oil to help nutritionally manage dogs with epilepsy that are also being administered AEDs. The diet is enhanced with a unique blend of nutrients—eicosapentaenoic acid (EPA), docosahexaenoic acid (DHA), arginine, antioxidants, and B vitamins, as well as MCT oil—to promote cognitive health and help nutritionally manage dogs with cognitive dysfunction syndrome. A properly planned diet can help nutritionally manage dogs with epilepsy as a supplement to veterinary therapy. Bollinger-Schmitz, K, Kline, K. An overview of canine idiopathic epilepsy for the small animal practitioner. Iowa State University Veterinarian Publication 2000;62(1). Berendt M, Farquhar RG, Mandigers PJJ, et al. International veterinary epilepsy task force consensus report of epilepsy definition, classification and terminology in companion animals. BMC Vet Res 2015;11:182. Skerritt G. Canine epilepsy. In Pract 1988;10:27-30. Packer RMA, Shihab NK, Torres BBJ, et al. Responses to successive anti-epileptic drugs in canine idiopathic epilepsy. Vet Rec 2015;176(8):203. Arrol L, Penderis J, Garosi L, et al. Aetiology and long-term outcome of juvenile epilepsy in 136 dogs. Vet Rec 2012;170:335. Podell M, Fenner W. Bromide therapy in refractory canine idiopathic epilepsy. J Vet Intern Med 1993;7:318-327. Trepanier L, Schwark W, Van Schoick A, et al. Therapeutic serum drug concentrations in epileptic dogs treated with potassium bromide alone or in combination with other anticonvulsants: 122 cases (1992-1996). JAVMA 1998;213:1449-1453. Schwartz-Porsche D, Loscher W, Frey H. Therapeutic efficacy of phenobarbital and primidone in canine epilepsy: a comparison. J Vet Pharmacol Ther 1985;8:113-119. Neal EG, Chaffe H, Schwartz RH, et al. A randomized trial of classical and medium-chain triglyceride ketogenic diets in the treatment of childhood epilepsy. Epilepsia 2009;50:1109-1117. Viitmaa R, Haaparanta-Solin M, Snellman M, et al. Cerebral glucose utilization measured with high resolution positron emission tomography in epileptic Finnish Spitz dogs and healthy dogs. Vet Radiol Ultrasound 2014;55:453-461. Jokinen TS, Haaparanta-Solin M, Viitmaa R et al. FDG-PET in healthy and epileptic Lagotto Romagnolo dogs and changes in brain glucose uptake with age. Vet Radiol Ultrasound 2014;55:331-341. Eom KD, Lim CY, Gu SH et al. Positron emission tomography features of canine necrotizing meningoencephalitis. Vet Radiol Ultrasound 2008;49:595-599. Kang BT, Kim SG, Lim CY et al. Correlation between fluorodeoxyglucose positron emission tomography and magnetic resonance imaging findings of non-suppurative meningoencephalitis in 5 dogs. Can Vet J 2010;51:986-992. Kim YK, Lee DS, Lee SK, et al. Differential features of metabolic abnormalities between medial and lateral temporal lobe epilepsy: quantitative analysis of 18F-FDG PET using SPM. J Nucl Med 2003;44:1006-1012. Galazzo IB, Mattoli MV, Pizzini FB, et al. Cerebral metabolism and perfusion in MR-negative individuals with refractory focal epilepsy assessed by simultaneous acquisition of 18F-FDG PET and arterial spin labeling. NeuroImage Clinical 2016;11:648-657. Patterson EE, Munana KR, Kirk CA, et al. Results of a ketogenic food trial for dogs with idiopathic epilepsy. J Vet Int Med 2005;19:421. Law TH, Davies ES, Pan Y, et al. A randomised trial of a medium-chain TAG diet as treatment for dogs with idiopathic epilepsy. Br J Nutr 2015;114(9):1438-1447. Chang, PS, Augustin K, Boddum K, et al. Seizure control by decanoic acid through direct AMPA receptor inhibition. Brain 2015;25:1-13. Jason Gagné, DVM, DACVN, is a board-certified veterinary nutritionist employed by Nestlé Purina as a Director, Veterinary Technical Marketing. Jason works closely with innovation and renovation, development of clinical trials, and the Sales and Marketing departments of the Purina® Pro Plan® Veterinary Diets Brand. Prior to, and throughout his residency at Cornell, he served as an Associate Veterinarian in a small animal practice in Syracuse, New York. Jason has authored a number of publications in veterinary journals and textbooks, given scientific presentations at the regional and national level, taught a series of courses at Cornell, and serves as a scientific reviewer for leading journals.